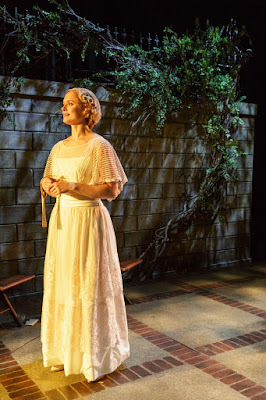 Primary Stages brings Horton Foote back to New York in a spirited revival of The Roads to Home. Comprised of three connected pieces, A Nightingale, The Dearest of Friends and Spring Dance, Foote transports the audience to Texas for a slice of life in the 1920s. Directed by long-time Foote collaborator Michael Wilson, The Roads to Home is a simply stated production. 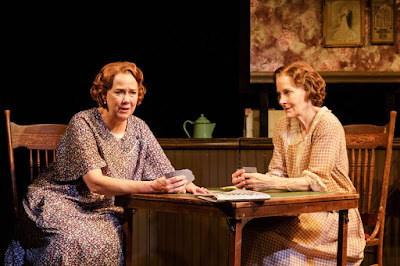 In the first act, neighbors Mabel and Vonnie sit in Mabel’s kitchen for a little talk and peep session. With stirrings surrounding Vonnie’s marriage as the central topic, the gossip and rumors take a turn toward Annie Long, a young woman who has found herself transplanted into a new life. Even with a loving husband and children, Annie has not recovered from her father’s murder. When Annie pays a visit, Mabel and Vonnie subdue the situation, playing off of Annie’s mental state. Six months later, Vonnie is still married to the man who is cheating on her, yearning for answers. She pays another visit to Mabel’s where Jack, who knows the situation, sleeps in his chair, listening to the women grapple with morality. A Nightingale and The Dearest of Friends are a thoughtful examination on perception in a time that seems to distant to our present. Vonnie will not divorce her husband despite his actions simply due to how others would perceive her. Today, Vonnie would not only shove divorce papers in her husbands face, she’d make a spectacle out of it. When it comes to Annie, Foote looks at how people of that time treated mental illness. Until she virtually breaks down, everyone makes excuses for Annie. They say she’s dealing with something. It’s a temporary thing. But the reality is that it’s much severe than that. Which brings us to Spring Dancing. This act focuses on Annie and her fellow patients at a mental institution in Austin during their spring dance. Annie, now four years in treatment, reads hers, as well as her friends, letters for him as a way to connect to home. The information she learns stirs her up a bit yet she keeps a sunny disposition. Foote’s language normalizes the characters in their dire situation. Without the context clues, perhaps you wouldn’t know where Annie and friends are. Foote’s story is very old-fashioned. It’s naturalism at it’s finest. And Michael Wilson plays into that. These are tales that look into tiny moments of individuals discussing the past. Yet nothing truly happens. And that’s ok. That’s what this play is. An examination. To alleviate monotony, Wilson heightened the comedy, as best he could. At least in the first act. The pacing left much to be desired though it helped tap into the honesty of Foote’s characters. The most theatrical element of the production happened to be Jeff Cowie’s scenic design. To portray the multi-room Votaugh household on the tiny stage of the Cherry Lane, Cowie offered a turn-table to divide kitchen from living room. Even with the tightness of necessary furniture, Wilson kept the movement alive. By the second act, the set was transformed into the outside of an auditorium. The vastness was alarming juxtaposed to the intimacy of the conversation. With the style that Foote writes in, life occurs throughout these conversations. Meaning the inclusion of ambiance is integral. If you didn’t notice John Gromada’s soundscape, that’s ok. It was perfectly present and effortlessly real. No offense to the men who did a fine job, The Roads to Home is all about the ladies. Bringing these women to life seemed old hat to this company. Hallie Foote as Mabel was equal parts sincere and amusing. She was a great ear to the always hilarious Harriet Harris as Vonnie. Even in her hysterics, Harris knows how to land a joke. 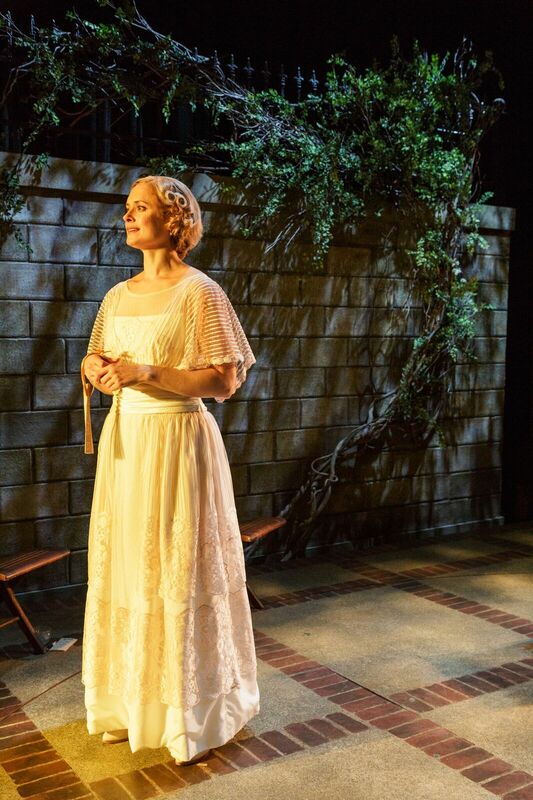 Taking on the difficult role of Annie, Rebecca Brooksher waltzed through the play. There was something ethereal to her character that purposefully never balanced out. The Roads to Home is all about perception and longing for home. Foote’s play has found a nice home with Primary Stages. But it’s perception is bound to be split. To some, it will be charming and resonate. To others, it will feel slow and dated. And that’s just how it is. The Roads to Home is what it is.